Time flies by so quickly. It was a year ago I was forced by a bad Lupus flare to take better care of myself. I have a lot of bad habits to break, and each one requires so much practice that I haven’t had time to do the fun things like crafting and blogging. Exercise and diet are in much better shape than they were a year ago. It required a lot of practice time to change from a sedentary lifestyle to one where I make sure I move every joint in my body every day. Dieting can still be a struggle, but even there, practice gets easier with time. I found that I just need to put forward a small bit of effort at first, and remind myself that all effort is cumulative. I plan to use this principle of some other problem areas of my life like the stash, and my messy filing system. I am looking forward to seeing what I can accomplish in the next year. I cleaned up part of the garden the other day. Last year I didn’t have much energy so the garden was a mess. I never have had much success with dill. 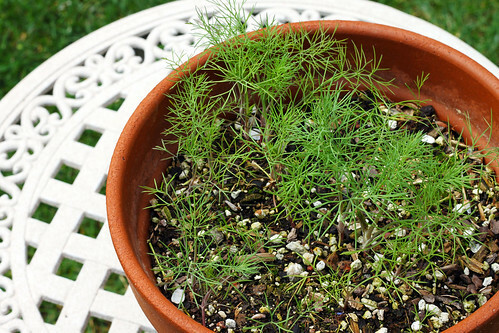 I found all this dill growing so nicely in an abandoned pot. I planted dill in the pot two years ago. I think it is because of all the rain and cooler weather that the dill has had a chance to develop a stronger roots. Last year there was just one little spindly plant in the pot I tried vainly to nurse to health. Sometimes plants need more time too. I wish I had more to share with everyone. I use crafting and blogging to not face some of the more difficult responsibilities of life. I am easily distracted, which is another bad habit I am working to break. The only way I know to do that at the moment is to take the temptation away and limit my time online. Hopefully with practice I can again share more with everyone. I do read your blog posts every time I am on the computer. I just have not given myself the luxury of writing comments. That should get better this coming year. Today I decided to practice keeping to a schedule, and I will schedule in time for crafting and blogging. I am a slow learner, so it might be awhile. This entry was posted on Wednesday, March 23rd, 2011 at 4:56 pm and is filed under Garden and Life. Tagged: Garden, Life. You can feed this entry. You can leave a response, or trackback from your own site. The past year has made a huge difference! Congratulations on successfully working to improve your health. I need to get back to my exercise routines and work on having a balance with it. Instead of all or nothing, I need to get to the point where I do it each week and accept that it’s ok to do it 5 days one week and 2 the next. 2 does make a difference! Joyce – there is so much to consider in your post. Those similar concerns that I have been trying to push back & “think about tomorrow”…I so admire what you have accomplished after setting goals for yourself. OMGosh! I am SOOO proud of you! Look at you GO girl! You are even growing DILL!?! WOW! I have a lot of catching up to do! I have gone back to my terrible eating habits because I got laid off…in DECEMBER on New year’s EVE, actually! Had to take a job out of state (that paid $10,000 MORE) and move 1,000 or so miles away!!! (well, maybe it was only more like 700 or 800) BUT I got a huge pay raise as you can see AND I live in an area where the cost of living is SO MUCH less that SO CAL ever was… it’s like 1/2 to 2/3 less!!! I am living in a 2 bedroom apt with a GARAGE for hundreds LESS! I have room for all my crafty goodies AND a craftroom! I just LOVE THAT! Now…having the boxes unpacked is a whole ‘nother story! LOL! Because I recently moved the kitchen is still unpacked because if I do too much (and try to work full time) my fibro will flare up! SOOOO! because the kitchen is still unpacked I am eating all fast foods! It’s ridiculous! So now I’m sick and on my second round of antibiotics and having fibromyalgia flares… it’s vicious cycle! I need someone to come help me get my kitchen organized and go shopping for me because I’m TOO Fatigued from the fibro to work and get it all done (CFS Chronic Fatigue Syndrome comes with the fibro) Gosh I am boring you to tears… anyway… look at how far you have come, my dear friend! That is great!